I finally gave in and created a dedicated section in my Malden (Ochre, personal size) for meal planning. As a homemaker, it is a big part of my day-to-day. Here is what I have included in my meal planning section: a weekly meal planner, a list of my family's favorite meals, a list of new recipes I want to try, and customized grocery list. 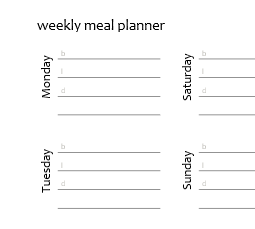 Weekly Meal Planner - I use a meal planner to organize my menu for the week. I homeschool so that means we eat a lot of lunches at home. My boys are involved in a lot of youth activities with our church, plus they have other outside sports activities they participate. Sometimes it is hard to know who is going to be home when! My meal planner has areas to plan breakfast, lunch, and dinner (they basically eat all day long, ha!) and there's an extra line for whatever I need. Currently, I have been writing appointments on that line - not to keep up with appointments, but to help me figure out what kind of meal to plan. Sometimes they are both gone during dinner, so my husband and I might eat out or eat something simple. There's another section for notes and I use that to plan what batch cooking I'm going to try for that week. You can download a Compact size version (4.25 x 6.75) of this planner here. I haven't always had a list of favorite meals in my planner. My recipe box serves the same purpose, but more and more I am finding myself meal planning on the go, and having it there with me saves me from wracking my brain on what to prepare. My customized grocery list initially took a while to create, but it has saved me so much time in the grocery store. It is arranged in the order that I walk through the store and it cuts down on forgetting an item. Feel free share about your own meal planning setup - it would be fun seeing how others do it.